Last year one of my Christmas presents was a Rockler Finger Joint Jig. This jig is for use on virtually any router table with a standard 3/4” miter slot. The jig features a smooth-sliding backer sled and three precision-machined aluminum indexing keys to give you air-tight joints with either 1/4”, 3/8” or 1/2” spacing. Works with stock up to 3/4” thick. I found that this jig works well but isn’t extremely accurate. The jig is easy to set up, but there is no real fine adjustment. The sliding backer sled tends to stick a bit and the joints although good aren’t extremely tight. I’ve made several boxes with this jig that turned out well, but I’ve had to fill the joints with a bit of wood putty in each case. I recently picked up an Incra IBox finger joint jig. The I-Box is an evolutionary leap forward from conventional box joint methods. This single jig can be used on both your table saw and your router table to produce symmetric patterns of traditional finger joints. In my testing, the IBox jig is a much better choice than the Rockler finger joint jig. The IBox has a incremental adjustment knob for fine adjustments and clear concise instructions on how to set it up and cut finger joints. In testing, I found the IBox is a great finger joint jig on the table saw, but I had issues trying it out on my router table. The finger joints I cut on the table saw came out dead on the first time. I would not have to do anything else to these joints to make them look awesome. On the other hand my first attempt at using the jig on my router table turned out horrible joints. The joints were so bad that I figured that I must have done something terribly wrong during the set up. Back to the drawing board I went. To make sure I hadn’t screwed something up during the set up I went back to the instructions and went slowly step by step to set the jig up a second time. Same horrible results. I’m sure I’m doing something wrong, but with the great results I’m getting on the table saw, I’m not going to waste my time with the router any longer. In conclusion for cutting finger joints, I’ll be using my IBox finger joint jig on my table saw and certainly not on my router table. 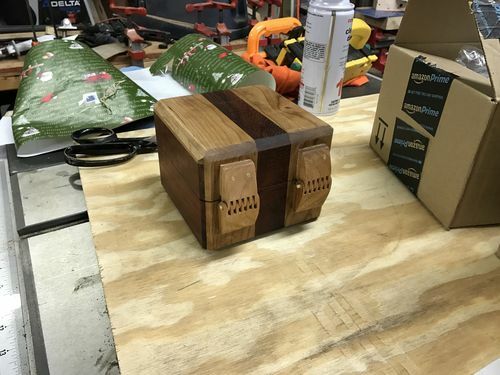 I would have given the Incra IBox 5 stars if it had worked well with my router table, but something is wrong and I followed the instructions to the letter. I think I’ll be putting the Rockler jig up for sale on Craigslist. With the Ibox, I usually just skip the instructions. The easiest way to set it up is cut once to set the spacing of the tabs, space them so the cut piece has to be pushed on. Next move it over to where it looks right, then test cut and make the final adjustments. In the instructions it looks like it will work like magic on the setup, but it is not magic. the jig will make extremely accurate joints though. With the Ibox, I usually just skip the instructions. Same here. I found their kiss calibration and twist a couple of knobs method to be frustrating to get right. I almost gave up on the jig. Makes for great videos though. I use my router table with a spiral bit. That seems to give me the cleanest cuts. Once the guides are set to the correct width in the test cut, the only variable left is the space from the guide to the blade. I use digital calipers and set that to a few thousandths less than the width of the cut using the silver knob. Generally one test joint is all it takes to verify the setup before I start cutting on the expensive exotics. 1) what are you showing in image 3? 2) with the Incra IBox, can you do single saw blade width slots/joints? Like you would do for a hinge? Hi Chris, I didn’t write the review, but the minimum kerf for the iBox is 1/8 inch. Also, the Incra Hinge Crafter is an accessory to the iBox that allows making wooden hinges. I agree with the instructions as well, however I went through the them and got great results with table saw. I thought about the router but feel the table saw has more power and surface area with dado blades. Plus I have a real nice dado setup. Glad your enjoying jig. Thx for review. normally I use a brass set up block and it works out fine, but if the router bit is not exactly the same size as the setup block you will get a mess. ... Or if you set up and the cutter blade is not right at dead center, you will be off by a significant amount. Now that you are having problems with the Ibox on the router table, I would think that your problem lies in the setup procedure. It sounds to me as if the problem is with your router table, since you say box joints came out poorly on that with either jig. Image 3 shows the issues I was having with the router vs the table saw. A 1/8” blade can be used with the Incra IBox jig. Just a suggestion, you might consider making a 2nd review for the Rockler jig. Even though the title says comparing jigs, if someone was looking for a review of the Rockler it won’t be easy to find listed under Incra. And thanks for the review. OK, if I zoom in I can see the problem. I just couldn’t identify what I was even looking at at first. That has nothing to do with using a router. It’s just bad setup. The guides are way too close to the bit. That should have been obvious just from looking at it before finishing the complete joint. Like I said above, I like to use digital calipers to set that distance just a few thousandths smaller than the width of the cut. To set it up, I turn the red knob until the fit is nice and snug, then turn the silver knob until the guides are a proper distance from the bit. I also reach under the table and rotate the bit against the calipers to be sure the measurement is correct. Again, as I said above, I use a spiral bit since the cuts are much cleaner than fluted. If you are using a fluted bit, be sure to give it a full rotation, since even on top name bits, there can be a small difference between the two flutes. You can also make just two passes and measure the width of the finger and the width of the slot to see if it’s set up properly before you waste time cutting a complete test joint. It’ll save you tons of time. I have a fancy finger template for my Leigh dovetail jig (18” superjig). It works, but I prefer my shop made TS jig. Given the option between box joints and dovetails, I will almost always choose dovetails because of the way the joint mechanically locks together. Eric, speaking of wasting exotics, I had an issue with the board slipping during the cut. It only happened maybe three times, but when it does, there’s no recovering it. I attached a strip of 220 grit to the backer board high enough up so the bit (or blade) wouldn’t contact it. I also found that a trigger clamp is more secure than the handscrew they recommend. 1. The miter slot on my router table was too wide, so I had to work really hard to get the little plastic things to expand enough to take up the gap. 2. I had to adjust how the miter slot guide fit the miter slot. I needed to a couple of washers between the jig and the miter guide to make it fit so that the little plastic things could be adjusted and touch the sides of miter slot. Once I did that it finally removed the slop from miter slop. Without it, the miter jig would move maybe 1/32” left and right. 3. I tried following the “Kiss” calibration, but it seemed to make finger joints that were way too tight. What I found worked was to use the kiss calibration to get the initial setting and then to get out my digital calibers and adjust the gap between the router bit and jig stop. 4. And then as other said in some other threads, really important to secure the board on the jig. The use of a clamp is a MUST. The torque of the router bit will move the board if it isn’t securely clamp. After I did all that it worked fine.